The Oyster World Rally divisa est in tres partes like Gaul. Leg one is from Antigua to New Zealand leaving January 15th 2017 and arriving in Auckland in late October. 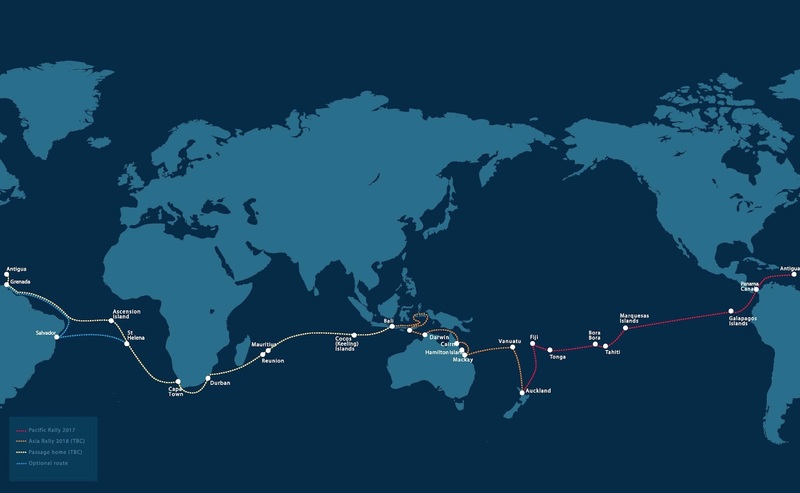 Leg two is from Auckland to Bali from April to September 2018 and then part three is the long way home from Bali back to Antigua via the Indian Ocean, South Africa, and the Southern Atlantic Ocean. We are signed up for Leg one. Our boat is 57 feet long, sleeps 8 in 4 cabins, though we won't be more than 6 on board at any one time, and we are planning to sail from Panama to the Galapagos just the two of us. The yacht is very well equipped and comfortable with a watermaker, two fridges, a freezer, an ice-maker, and a washing machine. All of that takes lots of power and so we have a generator as well as the engine and two small solar panels. Sailing is designed to be easy to handle from the cockpit and safe; so we have a big genoa, a small staysail which is very useful when the wind really blows, an in-mast furling main, and an asymmetric spinnaker which we fly from a small bowsprit. We can sail happily all day at 8 knots of boat speed. We need 8+ knots of wind to go and she is really comfortable from 12+ knots. For communications, we have a satellite connection for phone and data, a satellite tracking device that you can follow our progress on, and a long range radio. We will be using a sextant for astro navigation but we have lots of electronic devices and chart plotters, as well as paper charts, so we can do it the old way if needed. You don't drop anchor in 4000m of water, so we will sail 24 hours-a-day on passage. Watch-keeping tends to be in 3 hour watches, so with 6 on board you can get 6 hours of sleep between your turn on deck with 2 people on watch which is sociable and safe.